The answer to this question is based on your definition of “best” when you select an investment advisor. Is he the investment advisor with the best performance or the lowest expenses? Is he the advisor with the best personality? Or, and this is the big one, is he the advisor who is best at telling you what you want to hear? Determining the best investment advisor should not be a beauty contest. It should be a completely objective process that gathers the same information from multiple advisors so it is easy to compare their responses. The determination should be based on one or more interviews and you control the agenda. If you do not have an interview agenda all you will hear is sales pitches and undocumented sales claims. You will not get the information you need to select the best investment advisor. So who are the best investment advisors? What criteria should you look at to make this determination? The best investment advisors are Registered Investment Advisors (RIAs) or Investment Advisor Representatives (IARs). IARs work for or are registered with RIAs. These registrations permit professionals to provide financial advice and ongoing services for fees. If an advisor does not hold these registrations he is really a sales representative who sells investment products for commissions. You want a financial fiduciary investing your assets. They are held to the highest ethical standards on the financial service industry. This standard is much higher than the one for stockbrokers who are supposed to make suitable recommendations, but do not have to put your financial interests ahead of their own. To protect your financial interests, require advisors to acknowledge they are financial fiduciaries in writing. The appropriate way to pay for financial advice is with a fee. It does not matter what service the investment advisor is providing. You should be paying a fee for his knowledge, advice, and services. Most high quality investment advisors charge hourly or fixed fees for their planning services and asset-based (% of assets) fees for their investment services. Do not select advisors whose only method of compensation is commissions. They are salesmen. 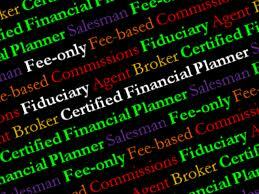 Many of the best investment advisors have various certifications and designations. The three with the most prestige are CFA®, CIMA®, and CFP®. Be aware there are also bogus credentials that advisors buy so they look more knowledgeable than they really are. Bogus credentials have no meaningful prerequisites, curriculums, tests, or continuing education requirements. It takes years of experience to become an expert investment advisor. But, it also depends on how those years were spent. Were they spent selling investment products or acquiring increasing amounts of investment knowledge? The answer to this question may determine the quality of the investment advisor you are interviewing. Also, do not be fooled by chronological age. A lot of people enter the financial service industry in their 30’s or 40’s. They may look experienced, but they are not. The best investment advisors are also ethical. But, how do you determine if they are ethical. The best way is to obtain the advisor’s CRD number and go to FINRA.org/BrokerCheck. Input the CRD number to view the advisors’ compliance records. Pay particular attention to complaints that resulted in a payment from the advisor to the investors. Also, do not put much value on references who tell you how ethical the advisor may be. In general, statements from references are worthless because no advisor will give you a bad reference. They are pre-screened and even coached to make the right statements.